Teens in the internet era grow up at an exponential rate, as the endless amount of images on social media influence their fast transition to adulthood. In the force of this speed, it becomes easy to forget the tender awkwardness that defines adolescence: silently getting used to the changes of puberty, becoming comfortable in new, adult skin and tuning into a whole new realm of emotion. 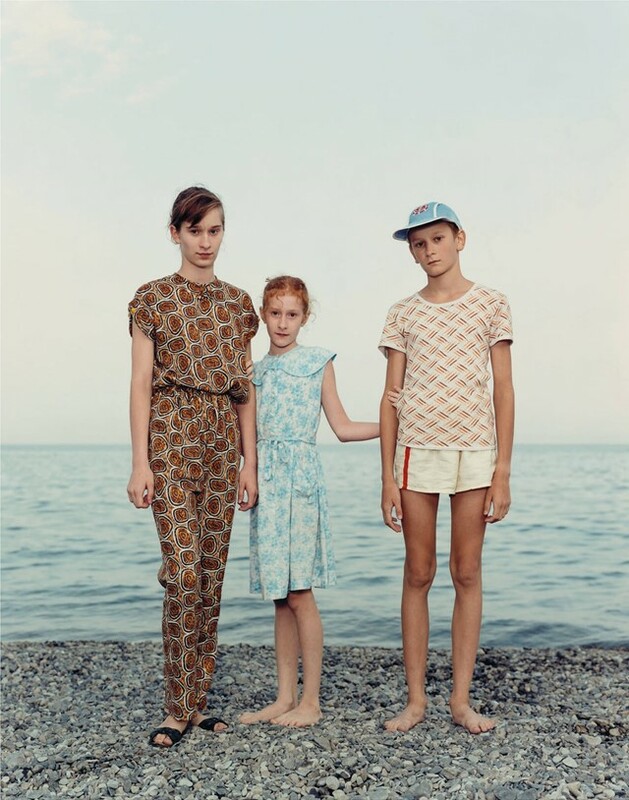 Luckily, the photos of Dutch icon Rineke Dijkstra immortalise this intensely vulnerable coming-of-age. And it’s the raw state of her 1992-94 Beach Portrait series, with its icy, muted tones and intricate detailing, that elicits haunting nostalgia on anyone who has ever experienced puberty. Dijkstra is obsessed with time, and making it stand still. Across her 30 year body of work, Dijkstra freezes fleeting moments forever, whether it’s teens transitioning into adulthood, new mothers growing into motherhood, or one of the many subjects whose she's traced for over 14 years in a bid to capture them at different stages of their lives. In Dijkstra’s commitment to transitory states, she has infused stagnant portrait photography with new energy, blurring the lines between classic portrait painting and modern photography. It’s this influence that inspired De Pont gallery in Tilburg to host their current show Rineke Dijkstra – Retrospective running until 22 July. In light of her recent retrospective, here’s why you need to know Rineke Dijkstra. Rineke Dijkstra claims she took her first good photo in 1980 before attending photography school. At the time, she was studying to become an art teacher but discovered she was drawn to photographing people instead. Because she was shy, the first photos she took of people were from the back out of fear of asking them for their photo. It wasn’t until she went to Rome that she took her first photo from the front. From there, she went on to be a commercial portrait photographer until an unfortunate bicycle accident left her with a broken hip that forced her to be bedridden for months. While recovering from the accident in rehab, she snapped her 1991 “Self Portrait” that redirected her career entirely, and turned her work into the influence it is today. Taken with a 4X5 field camera, Dijkstra appears in the shot exhausted just after a gruelling rehabilitation swim. This is the first time Dijkstra documented someone in a transitory state, as she appears in the process of recovering her health. In many Dijkstra works, you can find references to past master paintings which illuminate the photo icon’s ability to blur the line between the two mediums. “Kolobrzeg, Poland, July 26” (1992), a part of Beach Portraits, is one of most contemporary references to Andreas Botticelli’s “The Birth of Venus” (1482). Without even intending for it to do so, the image features a teenage girl in the same pose, posture and immersed in the same landscape as Botticelli’s “Venus”. Like Botticelli, Dijkstra’s “Kolobrzeg” takes on a Contrapposto composure, which is the Italian term for how the subject is posed: weight on the right leg, the left leg weightless to relay grace and beauty. But unlike the romanticism of Botticelli's painting, Dijkstra's image uses stark fill flash lighting to illuminate a very real and raw adolescent vulnerability in all its imperfections: uneven skin tone and awkward body shape. “Odessa, Ukraine, August 4” (1993), which also features in Beach Portraits, is said to reference Paul Cezanne’s “Male Bather” (1955). American photographer Bruce Davidson was Dijkstra’s first influence. It was the beautiful black and white portraits of Davidson’s East 100th street (1966–1968) that drew Dijkstra towards social documentary photography that illuminates humanism. From there, she was influenced by French photographers like Robert Doisneau, who captured life on Parisian streets in the 1950s, and celebrity portrait photographers like Richard Avedon and Irving Penn. In 1983, she found inspiration in the work of Diane Arbus and in 1994, it was August Sander that influenced her work heavily, the pair both eliciting the same stiff, painterly composure of portraiture on their subjects. It's common for Dijkstra to spend many years tracing the transition of her subjects as they grow into different stages of their lives. Olivier (2000-03) is Dijkstra’s most well known single-subject series that traces the evolution of French boy, Olivier, from teenager to enlistment with the French Foreign Legion. Each photo is taken in the same direct portrait style that Dijkstra is known for, making it noticeable the visual differences in Olivier as he develops into a soldier. As the series progresses, Olivier transforms from the innocence of adolescence to the harsh state of the military. In the series’ first shot taken in 2000, Olivier appears baby-faced, with traces of fear in his eyes. But by the series’ last shot in 2003, Olivier appears almost ten years older. Apart from the obvious physical changes like a buzzcut and uniform, Olivier appears sterile and emotionally degraded by the effects of violence and war. Almerisa (1994-2008) is another longterm series by Dijkstra, which includes 11 photos taken over 14 years that shows the growth of a young Bosnian refugee named Almerisa from teenhood, to adulthood, motherhood and beyond. Aside from transitory states, Rineke Dijkstra likes to capture people in moments when inhibitions are completely lost in front of the camera, at a time when they don’t have everything under control. For Dijkstra, this is usually after momentous physical and emotional feats, including mothers after birth and bullfighters after the bullring. Mothers (1994) features three starkly direct, yet beautiful portraits of mothers after childbirth, each bearing marks of the recent physical and emotional ordeals: a trickle of blood down the leg or a cesarean scar. In the same year, Dijkstra shot a series of matadors just after they have left the ring. Both of the series together draw a parallel between the catharsis of enduring a life-threatening emotional and physical situation. In 2009, Dijkstra moved onto video when she made The Krazyhouse (Megan, Simon, Nicky, Philip, Dee) in Liverpool. In the clip, teenagers scouted at Liverpool’s Krazyhouse club dance to music from pop to techno and heavy metal, letting go completely in front of the camera.